i dont see a swap file in the Ksgard system monitor..
should there be a swap file..
would it aid performance...is it necessary..
and how can i make one...??? Last edited by phaseshifter on Sun Apr 14, 2019 10:27 am, edited 1 time in total. Build It And They Will Come...Be Bold And Mighty Forces Will Come To Your Aid..!!! 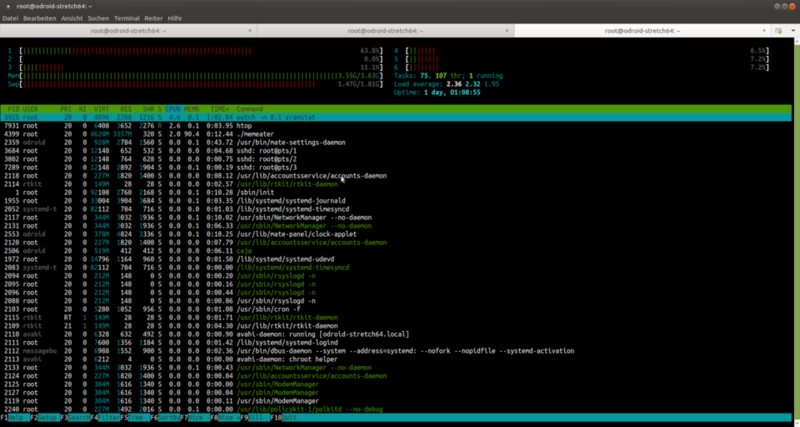 With 4 Gb Ram you will rarely need swap when using Linux . So, no there does'nt need to be a swap file. This will create a 2Gb swapfile in your system root , and activate it until you reboot. You can change the filepath to your fastest available storage to get max performance. To unmount your swapfile without rebooting just do "swapoff /swap.img"
i have some mem of zram..but cannot remember how to do it on arm64 ....???? Configuration seems pretty straight forward. And there's an example at the end for enabling it. so cool i made mine 512 meg..
firstly install the package...after the inital setup explained below you have to reboot and then it`s done..and then it is configured on every reboot..
if you wish to change ram size at any time... simply edit the /etc/rc.local and change it to the value that you require..then reboot..
Last edited by phaseshifter on Wed Apr 17, 2019 7:13 am, edited 7 times in total. I am not sure if both of you know what a swap array ( no matter if partition, disk, file or whatever) is made for. But if you are running out of ram what is the reason to swap on your N2 and you create a swapfile within your ram , we'll that doesn't make much sense, does it? If you create swap like this, then there is no need for it. Zram makes sense on Servers with huge ammounts of RAM but not with 4Gb. Better stick to fast Flash memory and use your RAM for what it is made for. In practice I found zram helpful in situations where the system was low on ram, but didn't need a whole lot of extra ram. Since ram is quite compressible and the cpu is fast zram is typically faster than disk swap. Really? Ok. I've once read about zram or compressed ram in general when having big server systems where you can easily spare a few (hundred) gigabyte for data that needs to be quick available but would take to much space within (uncompressed)ram. Didn't think that this would be useful if you have little ram available. Thank you phaseshifter. I was looking how to enable it on the N2. Your way done it. zram-config doesn't seem to be working. ZRAM is just of the most importance with small ram sizes. When only 512MB can be used, 256MB extra zram is very helpful. The quad-cores can handle this with ease. I now needed it because I'm running out of ram when doing Blender renderings. So 4 + 2 = 6GB useable memory. Makes a huge difference to me. Last edited by BadPritt on Sun Apr 14, 2019 2:05 am, edited 1 time in total. Last edited by phaseshifter on Mon Apr 15, 2019 7:29 am, edited 6 times in total. If people are using compcache on the N2 maybe HK could enable lz4 support in the kernel. Currently I don't believe you can use this with zram due to the config and it would be my preferred compressor of those available. could a size option be an entry in the boot.ini file?? ZRAM doesn't seem to work right for me. I'm trying to render some images with Blender in 4K. For that I need a lot of ram. But with zram enabled, Blender crashes when it goes over the default 3.6GB ram. It doesn't use zram at all. I'm now working with ubuntu-18.04.2-4.9-mate-odroid-n2-20190325.img. It was the same with ubuntu minimal. But the mate image did solve some other issue's. Here before starting the render. I've got 1.5GB zram. I'm using LXDE because it's using less resources. Here it went over the available ram, and didn't use zram instead. It just shut down blender. I hope someone can help me. It doesn't need a lot more. If I lower the settings of Blender more, then the quality of my image will not be good enough for 4K. I was able to do a lot other images, and it does it great otherwise. what size is your media /emmc/sd-card..??? But zram should be better. Never a decimal or comma. I'l check tomorrow if that helps. Swap file could also be a possibillity, I don't care how long it renders. As long as it does. Only when I'll do my animations I'll need to lower the render times a lot, but that's not 4k. i dont know it`s beyond me..
My understanding of zram is that each zram "partition" is bound to a cpu core. So if you only have one it would be bound to core0, which is little. If your program is running on the big cores it may not be able to use zram. zram-ctl creates as many zram devices as cores and should have fewer problems. I think they use this script for that. I can't understand a thing of what that code does. I'll look back into it tonight. If anyone has an idea how to do this manually. Please let me know. if the config tool did not set it up properly. Thank you. The result of that is 6. So it should mean all 6 cores have access to it. But that's not what I'm experiencing. I've now tried again, and it's a little different. Why I don't know. Now it starts using the zram until about 300MB. And then it crashed. Only thing changed is I now have set it up in rc.local instead of doing it manually. I'll try to make a swap file instead and see if that works. Thank you all. It is the same with a swap file. I disabled the zram and created a swap file of 4GB. It again started to write stuff to the swap, but then crashed at about the same point. I'll have to try to keep it under 3.6GB for now. For my animations that's no problem at all. Only when trying to make high quality renders. Any way of lowering the video ram? It wasn't possible with the C2, so I guess not. I've rendered that image this afternoon with my pc while I was gone working. So not too big a problem. But I would like to find a sollution for it. I'll do more tests with other sbc's. But I'm sure the NanoPi M4 did this well. That one only has 2GB ram, so I had to use zram to be able to render anything with quality on it. What does dmesg say when the app crashes? I also saw this message above it about low voltage detected. Probably has got nothing to do with this, but could be causing some other problems I've got. [   14.842850] rtc-pcf8563 3-0051: low voltage detected, date/time is not reliable. Thank you. I've added the link to my favorites to try this tomorrow. I hope it helps. Now rendering another image, 5h30m to go At least I can now play games on my pc, and sleep without noise. I love the N2. This increases my productivity a lot. - Change the MEM Cache Limit in the User Preferences System & OpenGL tab. - Use the Big Render script to render sub-sections of the overall image, and then paste them together. - etc Google for more. The H2 can have more ram than the N2, but I don't think it's got as much CPU power for this. I tried changing it to the double amount (2048) and triple. But this doesn't make a change. Trust me, I've googled it. But can't find a good solution for this. There is no device sda2. I'm using a eMMC instead of an SD card. You mean /dev/mmcblk0p2 instead? I tried that, I've changed "oom_score_adj to -1000 or oom_adj to -17 "
But it also didn't make a difference. There's a lot more on that link I've got to read. There are also 3 other issue's I'm encountering. There's a problem with my wifi dongles not being recognized at boot. And sometimes my desktop crashes and brings me back the the login screen, and wifi doesn't work anymore then either. Here dmesg after boot without working wifi. It's the same output after a desktop crash-re-login. Another issue, it's got problems mounting drives. It often makes 2 mounting points in /media/, and sometimes none work. If I unplug the sd-card/ssd then the mount point doesn't remove itself. As last I've had some hard crashes when the screensaver should come on. The display doesn't go black, and screensaver doesn't come on. It either logs me out of the desktop. Or it crashes the desktop where nothing moves anymore. 1.Another issue, it's got problems mounting drives. It often makes 2 mounting points in /media/, and sometimes none work. If I unplug the sd-card/ssd then the mount point doesn't remove itself. 2.As last I've had some hard crashes when the screensaver should come on. The display doesn't go black, and screensaver doesn't come on. It either logs me out of the desktop. Or it crashes the desktop where nothing moves anymore. On no 2. I've disabled the screensaver and everything else in Light Locker Settings. It didn't disable it. But instead of not working, it now does just start the screensaver. I checked again, and everything is turned off. My 5h render crashed last night because of that bug. When I got up the display was still showing blender at the half of the render, and everything frozen. Doing it again now while moving the mouse every once in a while. It starts off by allocation 2047 MB at start, when I tried more the application would segfault. After that it will increase memory allocation 1MB every 200ms. So obviously the program will run for a little while until it starts swapping. If you allocate mem too quickly the OOM will kill the process. I later increased the rate to 50ms which worked fine as well.. I haven't tried to find out at what rate the process will be killed, but 50ms is actually quite fast and it will only take a minute or so until mem and zram is full. That did work. I tried with zram alone, and with zram + swap file. I let it run until everything was full. Then it crashed in one of the 2 ways blender crashes. Shutting down all running programs and restarting the desktop. I'm now rendering my last image. After that I'll try with other software like Kdenlive to use a lot of zram. sorry i dont understand all the code you guy`s are going on about..when you guy`s get it fixed could somebody tell me what and how to do it pls..does my earlier wiki post work and or with some modding ..i still am unshure..???? The zram does work, but maybe it could be optimized better. I will investigate it more tomorrow. I will compare the behaviour with other sbc's(nanopi m4, odroid c2 with Ubuntu Mate). And I'll see if I can use the armbian zram script on the N2 in Ubuntu. That configures everything a bit more fancy, per core there's a zramx. I'm done rendering backgrounds, so I've got time to test. ok so my post is good but need`s some attention..when you get it figured out can you pls post what i need to edit...i hope we can make a wiki entry as i think this is a good idea for other op`s in the future..phase..
Ah, thanks for this! I'm trying to build CLang8 with the system's gcc 7.3.0 and it kept failing with out of memory errors. Tossed in a 32GB SD card, formatted it, followed your instructions to set up a 24GB swap file and it seems to have done the trick (took 2 days to build though!! much slower than before). Watching via htop I never saw it dip into the swap file, but clearly it needed to. Don't know why so much memory is required, exactly. Nor so slow. Four changes since the last time I built CLang -- Ubuntu minimal 16.04 -> minimal 18.04, 32b -> 64b ARM, gcc version 5.4.x -> 7.3.0, and CLang 7 -> 8. Previously it built in 2GB of RAM, now it takes >4GB?! Seems unlikely to be because of the newer CLang, 64b will make some difference but it shouldn't be 2x more, the OS seems to consume about the same... so I'm thinking that gcc has gotten more memory hungry. All the more reason to use CLang. I've just tried with Kdenlive with 2 4K dummy video files so the swap would quickly be used. Identically the same behaviour as with Blender. I've tried it 2 times. Every time it starts using zram it crashes. The first time it crashed while scrubbing thru the project. It filled the ram completely, used a little zram and crashed. I didn't take screenshots then, then I opened the project again without scrubbing too much. Clicked render, and again the moment it went over the 3.6GB it crashed. Here the project with 2 video clips. The part used by zram is from the first time it crashed. It writes parts of the system that aren't in use first. Here right after the crash. I will reinstall Ubuntu Mate to confirm this. And then I'll try to make the armbian zram script work. I found that sometimes using regular swap may perform better than using zram. Although not in all cases. I have a couple of FNA games on the XU3/XU4 that use more RAM than the XU3/XU4 has available. Using zram causes the system to freeze and ultimately crashes the board, using regular swap (without zram) slows down the system immensely but the games were working for a while. But I also know it from the other side... compiling Chromium with regular swap caused the build process to fail and gcc crashed (OOM) while using extensive zram instead worked. That's something that should not be happening. On every Armbian system it works as it should. I've just done the same tests with the NanoPi M4. It's only got 2GB ram and 1GB zram. It filled the zram flawless. But of course it crashed Kdenlive when zram was full. But when also using a swap file this would work. 1 4K video clip. Loading the metadata is enough the go into zram. Changing some things already makes it go over it. I'm looking into the Armbian script. But they use a lot of data out of other armbian files. So I've got to figure out what is being done. The comments are very useful. But I'm not used reading code like this, it looks like C. But it's not the C I know. (I was a windows programmer ). It clearly defines 1 zram block per core. @tkaiser could help here. He's (co)writer of the script. The code is not that hard to read. And starts not much different than the zram-config from Ubuntu. 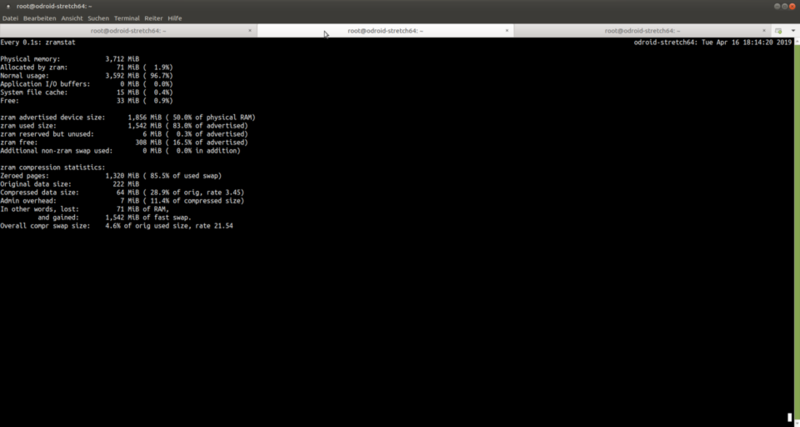 In fact it even uses the zram-config file from Ubuntu. It also doesn't differ too much from my zram-odroid package, except for some more code to provide the same outcome. The documentation states, it disables page readahead, means it doesn't cache pages that it reads from swap. Which apparently is faster for the first access and for that can benefit accessing zram, but also means more I/O for all following pages, as the system tries not to guess/cache what page needs to be loaded next. log2ram where they save log files into RAM which I really don't like. In a scenario where the board crashes your logs will be gone, and you can never find out what happened right before the crash. They also use compressed /tmp as a RAM device, which is probably fine, as /tmp is meant for temporary files anyway and in most modern OS it's a RAM drive anyway, they just move it to a compressed zram space. If you ignore the last two parts, they don't do much more than zram-config of Ubuntu, or zram-odroid from my repository. Just some wrapping and including in their own config files, which is fine, I do the same as well. This part makes a swap block per core. That's probably just an optimisation for flash storage. So there is a difference in how zram is declared and used. I do not know for sure if the problems of the N2 with zram would be fixed with this, but I'm going to try it because I need this to work for productivity use. That was also my main selling point, fastest cpu. So it should be best for things like that. I also red kernel 5.1 will bring improvements to zram performance. The problem is the same with a swap file only. So I do not think the problem is just zram. once again, this is nothing new. This is the content of /usr/bin/init-zram-swapping which is provided by zram-config from Ubuntu. You are right, it's the same. But why doesn't the script make the zram? We declare it ourselfs, we say to use 1 zram device. Normally you just need to install the script and reboot to have zram. Here that's not working.